Built in 1840, at the height of Duxbury’s wealth as a shipbuilding and merchant community, this historic building in the Greek Revival style is the congregation’s fourth meeting house. 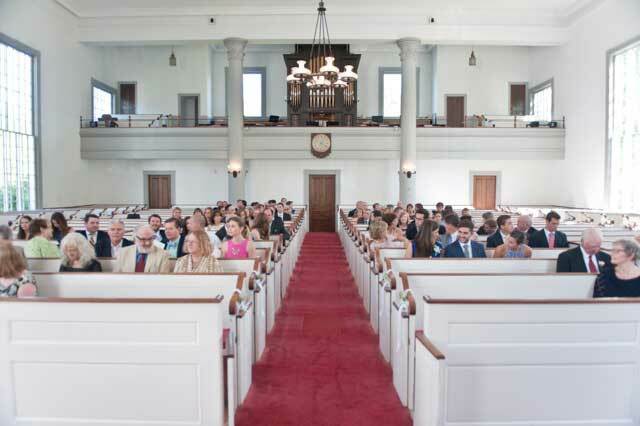 The Greek Revival design allows an enormous span with no interior columns (except at the rear of the sanctuary, supporting the choir loft and the steeple); the church seats about 500 people, and the center aisle is 60 feet long. The church pews were considered real estate and were sold by deed, with annual taxes levied upon them. Prices varied according to the desirability of location; from $25 for a pew located in the rear of the church to a high price of $175 (in 1840 dollars) for a center row pew near the pulpit. Furnishing the pew became a family affair. Scraps of carpet from Duxbury parlors and stairs were tacked to the floors and foot stools, for decoration and to minimize winter drafts. Most of the ragged carpeting has been removed, though some surviving samples can be found on some foot stools on the south side of the church. Other embellishments included attached folding seats for children, racks and drawers for Bibles and prayer books. The pulpit looks much the same as it did in 1840, with the exception of the pulpit hangings. Though the same color, the present hanging is a simplification of the elaborate, deeply festooned, swagged and tasseled “pulpit curtain” of 1840. It had an overlay of curtains, tied back on each side by fabric rosettes. Seth Peterson has been credited with creating the massive columned pulpit and scrolls, in flame walnut. (If our information is correct, he would have been 20 at the time. )The communion table and minister’s “settee” complete the furnishings in the Empire style. Hanging behind and on either side of the pulpit are two imposing tablets. They contain random selections from the Old and New Testament and were a gift of Captain Gershom Bradford, who had retired from the sea and was treasurer of the church in 1840. According to one source, the whale oil pulpit lamps and chandelier were installed in 1841 as a gift of the minister, Reverend Josiah Moore. Generator fluid and kerosene gradually replaced whale oil as cleaner-burning fuels after 1850. 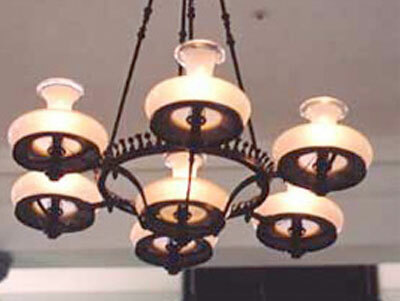 When the building was electrified about 1900, the old lamps were converted, but the chandelier was removed and replaced. Some years ago, the chandelier was discovered in pieces in the attic. It was reassembled, authentically restored, electrified and returned to its original location as a gift of Mrs. Verna Orndorff. 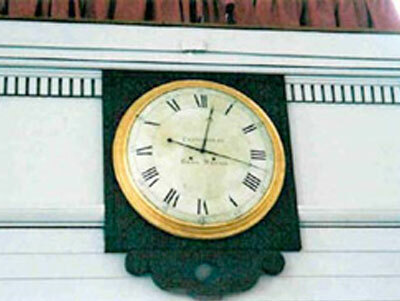 The clock on the front of the choir loft balcony, a gift of ship owner and merchant Ezra Weston, the town’s richest citizen, was retained from the third meeting house. It was updated for the new building by the addition of a new, flat frame in the Empire style. Fashioned entirely of pine, the frame was painted by a grainer to simulate the flame walnut of the pulpit. The organ in the choir loft was built by the William B. D. Simmons Company, an important builder of organs in the nineteenth century, Boston. It was purchased in part by the Ladies Association of the church, with funds raised from their Fair in 1853. 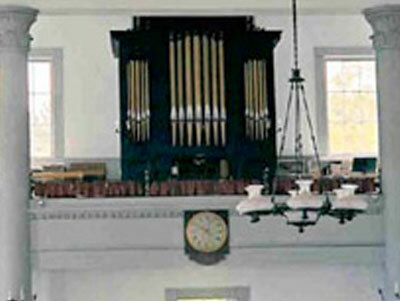 The organ was restored by the Andover Organ Company in 1967. 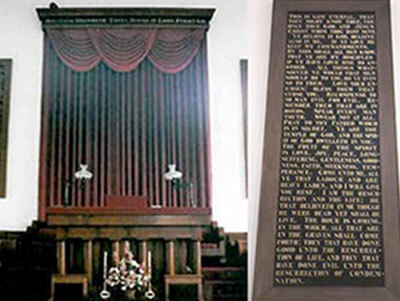 Reverend Josiah Moore, (minister from 1834 to 1881), removed the Pulpit Bible, printed in 1772, from the Third Meeting House and installed it in the present church in 1840.